Dave has been a pilot for more than 40 years having flown a variety of aircraft. After graduating from the Air Force Academy, he attended Air Force pilot training at the site of APS’s Arizona facility at Gateway Airport (formally Williams Air Force Base). Graduating near the top of his class he was chosen to return as an instructor pilot. He was an instructor, check airman, functional check pilot, and wing spin pilot flying the T-37, T-38, and F-5 during his tour culminating in being instructor pilot of the year. His follow-on assignment was flying F-15 Eagles out of McChord AFB, Washington. He later transitioned to the C-141 at McChord and was an aircraft commander, instructor pilot, and check airman flying worldwide missions including supporting the first Gulf War. In 1987 Dave started his 29-year career as a pilot for the Boeing Company. He ended up being qualified in all models and variants of the 737, 747, 757, 767, 777, and 787 aircraft. For his first 7 years, he was an instructor pilot conducting simulator training and initial operating experience flying airline operations for various airlines worldwide. He also was a CRM instructor and wrote training material for CRM, TCAS, Takeoff Safety and ETOPS training. In 1994 he was promoted to Chief Pilot Flight Operations Safety and launched into the ambitious project of bringing Upset Recovery Training to the industry. He co-chaired the Upset Recovery Training Aid industry team and wrote much of the pilot education material and training exercises. He later authored revisions 1 and 2 of the training aid. He did all of the initial training of Boeing instructors on the conduct of instructing upset recovery training in the simulator and developed course material and training videos. He was involved with industry efforts to include FAA-Industry Stall/Stick Pusher Training Working Group and International Committee for Aviation Training in Extended Envelopes (ICATEE). He promoted the material with presentations and magazine articles for various organizations such as the Flight Safety Foundation, Aviation Week, and the Royal Aeronautical Society. Additionally, he co-chaired the industry training aids involving CFIT, Wake Turbulence, and produced the ALAR (Approach and Landing Accident Reduction) videos for the Flight Safety Foundation. 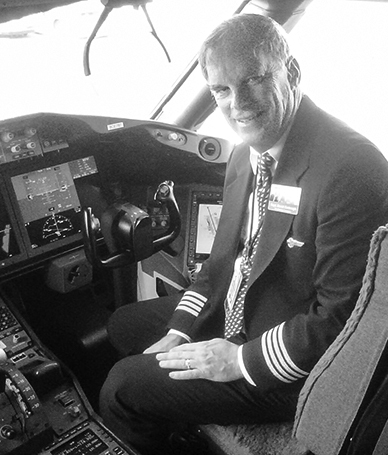 He led the pilot support of accident investigation, audits, and customer safety visits. He has received numerous awards to include Aviation Week Laurel, Flight Safety Foundation’s President and Lifetime achievement awards. In his last decade at Boeing he was Chief Pilot Technical and Safety for Test and Evaluation. He was responsible for all the operations and training manuals and checklists for all Boeing models. He was responsible for the safety of Boeing flight operations to include F-15, F-18, Apache and Chinook Helicopters, V-22, C-17, as well as all commercial models and variants. He conducted flight test on various Boeing aircraft to include 747-8 and 787 aircraft. Recipient of the European Flight Test Safety Award in 2013 from the Society of Experimental Test Pilots for contributions to flight test safety. Dave has worked closely with APS in the development of its various UPRT programs for the past 10 years. In early 2016, Dave officially joined the APS team. Capt. Carbaugh holds APS’ highest simulator qualification as an APS-certified Boeing Type-specific Boeing (All Models) Upset Prevention and Recovery Training (UPRT) Train-the-Trainer Instructor. He deploys globally to assist airlines with delivering APS’ UPRT directly to their airline pilots and/or assists airlines in developing their own internal ICAO-compliant, APS-certified Boeing UPRT program(s). Instructor Pilot T-37, C-141, 737, 747, 757, 767, and 777. Conducted initial Upset Recovery Training for all Boeing instructor pilots. 12,000 hours’ total time and 5,200 hours’ instructor time. Airline Transport Pilot Rating with over 12,000 hours’ total flight time.